I’ve started drinking Earl Grey Tea. Partly because I like the idea of ‘herbal aromas’ that are supposed to ‘delight the senses’……and partly because I’m not drinking coffee, and I’m out of my favorite green tea. At any rate, it’s 5:30 a.m., and I am drinking a cup of Earl Grey Tea. There is a beautiful hint of Lavender that can be tasted in a cup of Earl Grey Tea. Something earthy and organic, with just a hint of dried, grey floral. Earl Grey fills me with images of a quaint, stone potting shed in the south of France. 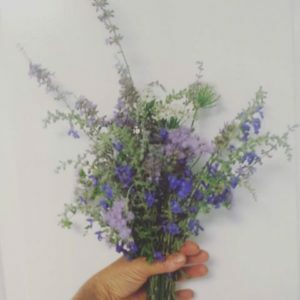 Lavender hangs from the ceiling, old Terracotta clay pots are casually stacked on the potting bench, and the aroma is full of earth, potting soil, dried Lavender and the wisdom of the old gardener, who lovingly tends the earth. Lavender is, by far, one of my favorite herbs to grow. The delightful purple flowers are an elegant addition to any garden. You can hold your head a bit higher whe someone notices you frow Lavender. “Why, yes. I grow three different varieties of Lavender.” Automatically, people assume you are a Master Gardener or a Culinary Chef…..which you probably are. Whether you harvest and dry the flowers, or just use it for cut flower bouquets or culinary reasons, Lavender is an herb definately worth the space in your garden. When growing Lavender, choose a hot, sunny location of your garden. Plant and water a bit until established…..and then totally leave it alone. Ignore it. Actually, turn your back on it. Lovingly, gaze at your Lavender from afar, but don’t let on you are pleased. Lavender loves the “hard-to-get” gardener, and performs best under hot, dry, unfavorable conditions. The more you ignore Lavender, the more it will thrive. Most gardening problems with Lavender is that the plant has been loved to death. There are numerous varieties of Lavender. My two favorites are Spanish and Fernleaf Lavender. Fernleaf Lavender is considered an annual because it is not freeze hardy. I’ve tried covering mine, to no avail. I’ve also tried it in pots to over-winter inside….not worth the work. Fernleaf Lavender is worth the $2.29 cents to just replace each year. It is an exceptionally fast growing herb. The flowers on Fernleaf are delightful and plentiful. Spanish Lavender, on the other hand, is a hardy perennial. The plant is a moderate grower, and will be filled with seasonal flowers. I’ve had Spanish Lavender plants that have lasted for years, until I intervened and started messing with nature. Pruning these plants can be a bit of an issue. Old wood sometimes gets in the way of the herb’s flower production. I’ve unintentionally killed a few Spanish Lavenders by pruning too hard, before the warmth of Spring. I have planted two beds of Lavender this year. I have Cemetary Iris circling the herbs. The Iris will bloom while the Lavender warms up. The Iris will then become a weed barrier for the ever-problematic bermuda grass. The Fernleaf is planted on the outside of the bed, circling the Spanish. I will replace the Fernleaf each year, and therefore I can weed and destroy the invasive bermuda intruders.. In a few months, I should have a nice, little patch of flowering Lavender in front of my potting shed. My Lavender will make all the French Lavender farms drool with flower-envy……or at least, that’s my plan. For now, I will take another sip of my Earl Grey Tea, and dream about being a French Lavender Gardener, with a quaint, stone potting shed and Lavender hanging everywhere…..and ofcourse, flower bulbs. Never forget the heirloom bulbs. It’s always good to dream big.